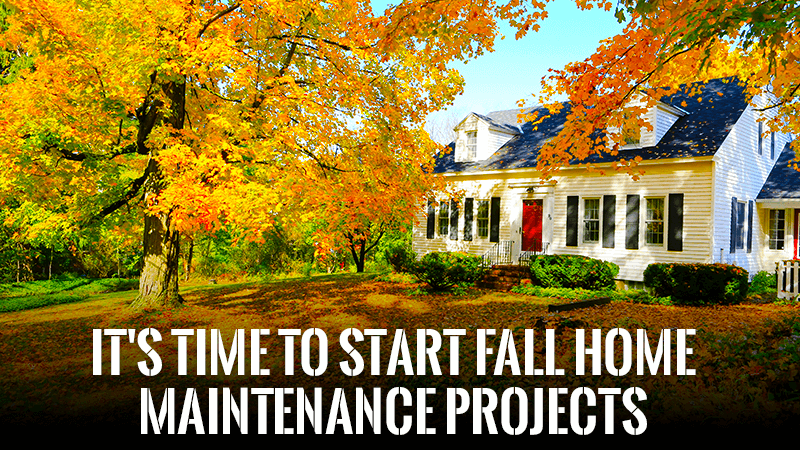 Start by cleaning your gutters and downspouts. Check drainage areas for leaves and other debris that might be blocking the flow. If you notice a lot of blockages, now is the time to consider installing gutter guards to make your next round of cleaning easier. Check your roof or hire a licensed roofer to do so. If shingles are cracked or curling, it’s time to replace them. In some cases, damage might be so severe that you’ll need to replace the entire roof. While you are outside, take a close look at exterior plumbing. To prevent outdoor pipes from bursting with the first freeze, turn off the valves and run the water until the pipes are completely drained. Wrap heating tape around pipes that run along outside walls as a backup measure. Take a walk along paved pathways and your entryway and look for any spots that need to be patched to avoid people falling when the area is covered in snow. Wash your lawn and patio furniture and then store it inside for the fall and winter. This keeps paint from peeling and cushions from fading and cracking. Examine the insulation in your attic to make sure it is properly installed with the vapor barrier facing down. If it is reversed, with the vapor barrier facing the roof, the material will likely attract and trap moisture. Change all your home’s HVAC filters and clean air filters in clothes dryers and stove vents. Taking this step will improve your chances of getting through the winter without developing sinusitis or upper airway infections as a result of breathing in dust when the heat is on regularly. Hire a professional HVAC contractor to test your home’s heating output and carbon monoxide levels and make any needed adjustments. Check interior plumbing, repairing or hiring plumbers to repair any leaks before colder temperatures arrive. Drain your hot water heater to make sure rust is not building up inside. If it is, now is the time to replace the appliance. Inspect your windows, making sure the caulking around window frames is in good shape. If your windows need to be replaced, it is better to do it now rather than wait until the weather becomes inhospitable. Find all the home improvement materials and products you need at Mike Sikora’s Dayton Home Improvement. Our inventory includes patio covers and enclosures, windows, vinyl siding and trim, shutters, roofing and more.